Gamification was a hot topic at this years Games For Change. Former Vice President Al Gore kicked off the 8th Annual Games for Change Festival in NYC with a presentation about global warming that included a little bit of game talk. There is no doubt that he knows what “gamification” is—he said the word 3 times! Gore says that, “Games are the new normal” and “the gamification trend is really powerful.” He ended his talk with a request that more people make quality games that can help solve the climate crisis. Below are four ways that gamification is already helping. Education – The event continued with a large focus on games in education. James Shelton (Assistant Deputy Secretary for Innovation & Improvement at the US Department of Education) said that within the current education system,students have “lost that gut feeling of winning”. He gave a powerful talk and mentioned that gamification can help bring US education back in the global education race. Shelton went on to say, “People that are struggling with something [in school]…there’s a better way. Make it fun!” He went on to say that “we are far from a saturation point” of applying gamification to education. He said to “just press ahead” with innovation. The more people and companies (private & public) that come up with new ways of teaching thru the use of game mechanics, the closer we’ll come to solutions in making learning fun again. Later in the day, Dan White (Filament Games) said that he hopes the future will present “textbooks that supplement the game, rather than the game supplementing the textbook.” A great vision on what the innovation of games could do for education. World Change – There were a few games mentioned that also touched on social issues beyond education, like Jane McGonigal, Natron Baxter and the World Bank Institute’s game, EVOKE. EVOKE is a game to help empower people around the world to concoct creative solutions to the world’s most urgent social problems. The first season of the game ended in successful fashion in spring of 2010. Stay tuned for Season 2! Laura Pincus Hartman (Mark Pincus’s sister) of Zynga.org stole the philanthropic spotlight with their mission of transforming the world through games. With all their nonprofit partners, they require the ability to “follow the dollars.” Wherever a donation goes, Zynga.org wants to know where each dollar is used and by who. It’s pretty impressive given that Zynga.org helps raise millions for organizations like the World Food Programme (WFP)—who has successfully used games to help feed the hungry. In NYC, the Come Out and Play Festival was a huge crowd favorite. Greg Trefry of Gigantic Mechanic and Co-Founder of the Festival, showcased Commons. Commons is a game where people compete to do good, while problems in the city get fixed. It resembles Foursquare, but instead of checking into a location, people “check-in” problems around the city—gaining points and badges for their good samaritanian work. Suzanne Kirkpatrick, Jamie Lin, and Nien Lam call their award-winning game “urban activism.” Their vision for Commons is to integrate it with NYC’s 311 system and then with more cities around the nation. Some extras… Games for Change was gamified with an engaging networking game for the attendees. The game was called Stakehold’em, designed by Karen Sideman and Parsons the New School for Design MFA students Oylum Boran, Mohini Dutta, Eulani Labay, Lien Tran and Roussina Valkova. 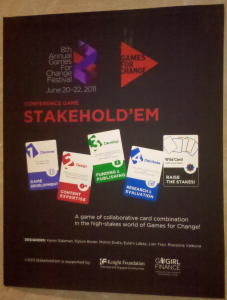 As for Games for Change, the event was a success. There was a good-sized audience, most of the seats were filled for the first day’s sessions, and many of the attendees were aware of “gamification.” It was great to see so many game mechanics being used for the good in the world. If you have any suggestions on games or designers that are looking to get involved in the games for change space, please feel free to reach out to us at Gamification.co and please mark your calendars for the Gamification Summit on September 15th and 16th here in NYC. When I was little, I loved Easter because there were a zillion little treasures just waiting for me to collect. Now I’m older, and I love your blog for the same reason. Thank you for everything I’m learning here.